The Genesis Flyer is a great winter bike or no-nonsense commuter and Genesis have sensibly concentrated the spend on the excellent frame and fork, with unexceptional but solid wheels and finishing kit that'll last for ages. Overall it's fun to ride as a training bike and with mudguard and rack mounts it's versatile enough to carry a load too. For £600 it's a great addition to your stable and it'll get plenty of use. First things first: the Flyer is a fun bike to ride. Much of that is down to the frame. It's no coincidence that the geometry of the Flyer is the same as that of the Genesis Equilibrium. The Equilibrium was instrumental in bringing steel back into the limelight, thanks in the main to the fact that it was – and still is – a lovely bike to ride. And the Flyer is too. Genesis have used several varieties of Reynolds tubing for the Equilibrium – 520, 725, 853 – but the Flyer uses what Genesis have dubbed their Mjölnir tubeset. It's a double butted, seamless 4130 chromoly, but the fact that's it unbranded means it's a bit cheaper and that leaves room for a slightly better spec at the same price. The steel frame is mated with a carbon/alloy fork and both frame and fork are designed for long-drop brakes with clearance for bigger tyres and mudguards. The Flyer doesn't suffer for not being a Reynolds-tubed frame. It's not a light bike at 9.65kg, but it responds really well to rider input and it has a supple feel, especially over rougher tarmac of which we have plenty round here. You need to put some oomph through the rear triangle to get a singlespeed to crest the hills and the Flyer copes with that admirably; it doesn't have the monolithic feel of a carbon bike but neither is it flexy enough to cause any problems. It's springy, if it's anything. And not in a bad way. Coming down the other side the Flyer doesn't really suffer for the lack of a tapered headset, with an assured and unfluttered gait on the descents. Mostly you'll be freewheeling them as the 68-inch gear spins out at not much over 20mph. The plus side of that is that it's a low enough gear to get up most of the climbs around here without expiring. For varied terrain it's pretty much the perfect gear. If you live somewhere flat you'll probably find yourself swapping the 18-tooth sprocket out for something a bit smaller. The position is comfortable and not especially racy. The 60cm I tested has a stack height of 612mm and a reach of 404mm. That's a stack-to-reach ratio of 1.51, which is well into sportive geometry (race bikes are rarely below 1.4, and a tourer would be closer to 1.7). It doesn't feel like you're catching too much of the wind and the compact drops offer a slightly more aero position when you need it, although given the geometry I'd probably be happy with a deeper drop for when the headwind is blowing, it's not like it would be too aggressive. The kit the Flyer is built up with is decent and sturdy. It's not top-end stuff but then at £600 there are going to be a few compromises. 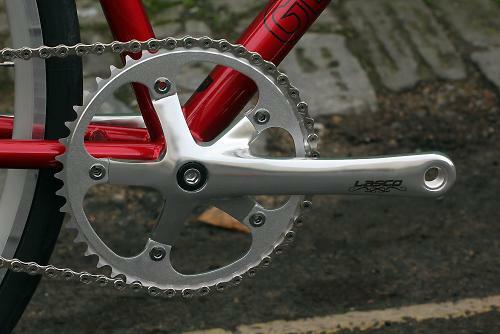 The Lasco 46-tooth chainset spins on a square taper cartridge bottom bracket. Some might look at that as a compromise but personally I think it's a sensible spec for a winter bike. Chainset and bottom bracket flex (there's a bit) are much less of an issue on bikes like this, especially a singlespeed where there's no mech rub to annoy you, and a cartridge bottom bracket will run for ages. The wheels are best described as solid: 32-hole Alex rims on deep-flange Joytech track hubs. Certainly they're not light but they stayed true throughout testing and they're stiff enough to cope with an uphill grind without any brake rub. The rear uses 120mm track spacing and has a flip-flop hub so you can also run the Flyer as a fixed wheel. 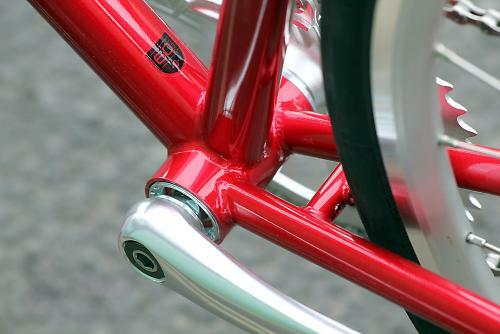 The frame has decent chain tensioners built into the dropouts; bear in mind that with rearward-facing horizontal dropouts, getting the back wheel out can be a bit of a fiddle if you decide to fit mudguards. It's worth buying an extra set of pop-out stay mounts, like you'd normally fit at the front, to allow you to move the 'guard out of the way. I took the Conti 28mm tyres off because they wouldn't fit under the mudguards I fitted; Genesis say there is room for 28s and 'guards but not the ones I tried. Anyway, the bike was a lot better with some fast-rolling 25s, the Contis are durable but they're wire-beaded and heavy and they feel a bit lifeless. Stopping them going round is a job for Tektro R315 long-drop callipers and RL-340 brake levers. They're not the most powerful brakes in the world – long drops seldom are – but they're decent enough and the lever shape is good, with a fairly long body for plenty of hand space. Fitting better quality brake pads once the stock ones wear out will improve matters. The Genesis-branded alloy finishing kit is all solid and unremarkable stuff. 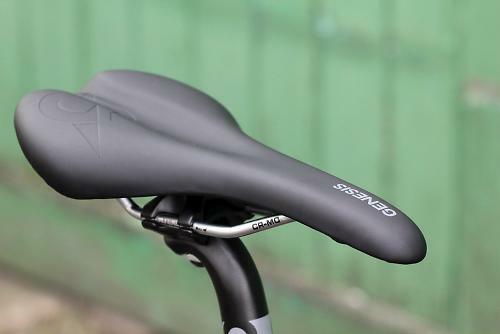 The bars are a good shape, the bar tape (often a problem on cheaper bikes) is decent and comfortable, and the same can be said of the saddle. Overall there's nothing really that's bad enough that you'd feel the need to swap it out before it's worn out, with the possible exception of the tyres. Most people will be looking at the Flyer as a winter trainer or everyday commuter, and for that sort of riding it's well-specced and fun to ride at a sensible price. The frame is excellent and versatile, and worthy of upgrading, and the stock build is all kit that's dependable and should last even in UK winter conditions. I'm not a fan of the tyres but those are easily swapped if you feel the same way. 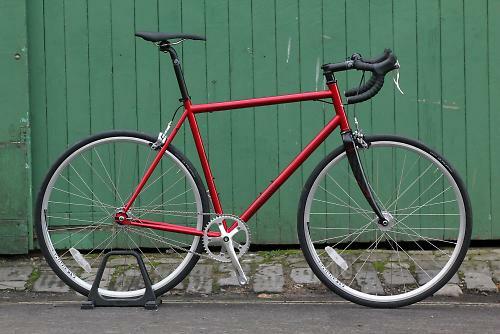 For £600 you're getting a well-thought-through bike with proven geometry. Recommended. Sportline have been in contact to let us know there'll be some running changes to the Flyer, some of which address points in this review. The rear-facing dropouts are to be replaced by a traditional forward/diagonal dropout which should make puncture fixes a lot easier on the roadside if you're running mudguards. Which you will be, because the Flyer will ship with 35mm Chromoplastic guards in the longest length Genesis could find them, with full mudflaps for maximum winter protection. The gear is lowered slightly more to a 65" (42x17) so you'll definitely need to budget for an extra freewheel if you live anywhere that's not too lumpy. Brakes are upgraded to Promax units with catridge pads (still long drop of course) and the 28mm Continental tyres get swapped for Maxxis Re-Fuse 25c rubber. All those changes together mean the bike should be an even better out-of-the-box winter trainer in its next incarnation. The Flyer borrows not only the tried, tested and loved geometry from our longstanding Equilibrium model but also its practical aspects like generous clearances, long-drop brake calipers and mudguard eyelets that make it such a popular UK choice for obvious, rather damp reasons. The new 'Mljonir' double-butted, seamless Chromoly tubeset opens up a little room for us to go full circle, adding back in the much-loved carbon fork that graced the original Flyer back in 2006/7; helping to drop weight and act as a nice buffer between the road and the handlebars. 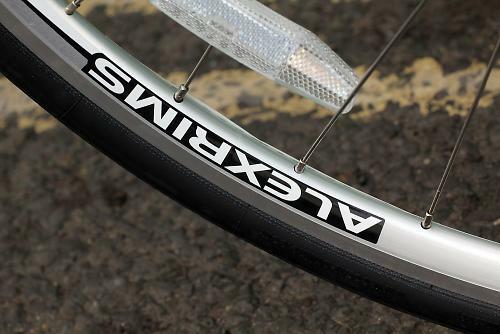 This 'single-speed Equilibrium' makes for a great winter trainer, and, with the majority of the UK's roads in a sorry state, never more so than in the depths of the winter months, we've taken advantage of the clearances and added 28mm tyres paired to new-school wide 22/17mm Alex AT470 rims. The result of the wider base is a vastly improved tyre profile and an increased interior volume, allowing lower pressures and increased comfort. The 46/18T gearing gives a perfect 'middle-of-the-road' ratio (68.4 gear inches) ensuring your knees don't pop on the climbs but you're not spinning out too quickly on the flat either. We've also kept the 120mm track rear spacing and flip-flop (fixed/free) rear hub for those wanting the option to run fixed. 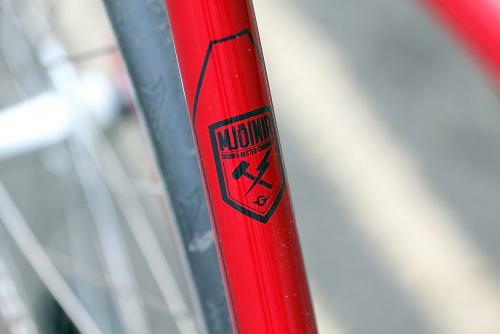 Functional, reliable and as-practical-a-singlespeed as you're ever likely to encounter. Nicely built with a high quality finish. There's some flex through the bottom bracket under power but it's never a problem. Not much is more efficient than a singlespeed. A bit with mudguards fitted, but not a problem. It's an assured bike with predictable handling. All good, even the stock bar tape and saddle. Tyres feel a bit draggy. I'm enjoying mine but it's shame they don't offer a choice of freewheel, I'd prefer a 16t as the 18t is a bit too light for fast cruising. I've seen this in the flesh and the shade of red is fantastic. I did consider buying one but think it's probably too nice-looking to leave locked up outside in London, sad to say. I have lusted after one of these for ages but I think I would possibly prefer a steel fork. While it's a good review I do wish the tester would have reviewed it as ridden on a fixed sprocket as that is what will reveal how it truly rides. 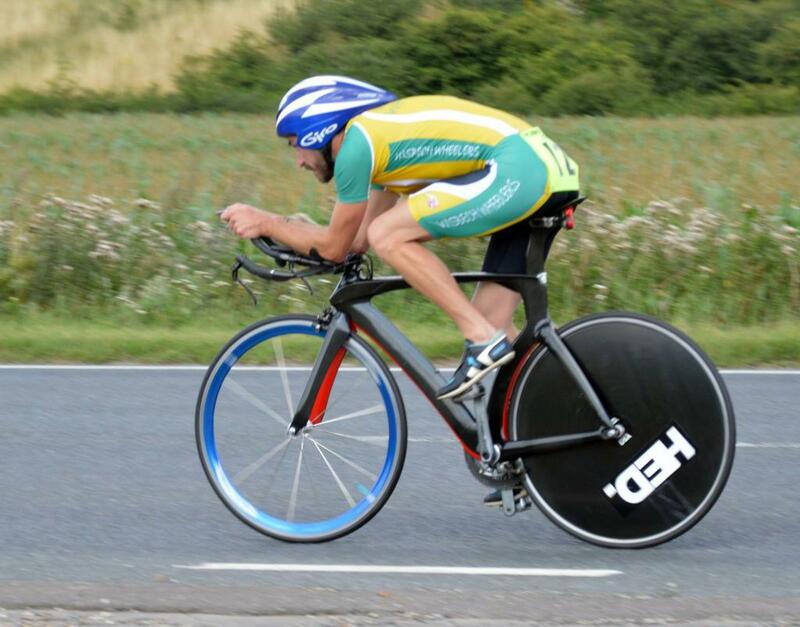 You are not getting the best out of a bike like this running it on a freewheel. My very own Cotic-Roadrat runs as a fixed with steel forks. I works; it’s reliable, without the anxiousness that the forks will be knocked or taken when left outside. My better half has the Equilibrium 2013 model in 'cherry-red'. It’s great to look at and is a reasonable ride, but the paintwork chips far too easily. The upgrades following feedback on this single-speed, is a good signal that Genesis are open to ideas. I just hope that the paint work improves and there would be an option to get steel forks in matching colours. If so, I too would get one. Road.cc test bikes as supplied and the Flyer only comes with a freewheel. 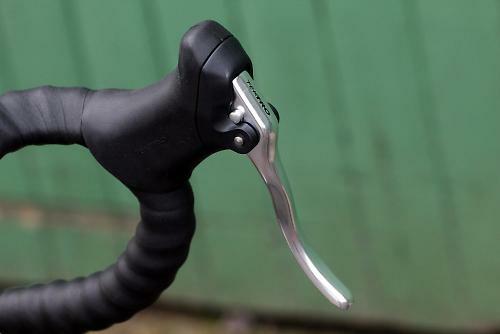 Not sure I'm keen on the future switch to horizontal dropouts. Maybe more convenient with guards but they look rubbish IMO. The comment about testing it fixed really is relevant - wouldn't have taken much and then any clearance issue would have been exposed, as well as bouncy-flexy high rpm issues that afflict cheap bikes. There is a previous version with straight steel-bladed forks still available to buy, can't remember what model year it is though. Agree with whoever mentioned the SHimano freewheels, those things are garbage. Well worth the upgrade to a White Industries or other premium one, Shimanos only used to last me 6 months, absolute nightmare. I had to laugh at the bit where it says the bike doesn't suffer for not having a tapered steerer. I would bet folding money that, in a blind test, 90% of amateur riders couldn't identify the one bike in ten that had one. I have a genesis day one that's been my winter bike/commuter since 2009 & I'd agree a bike like this needs to be run fixed. it doesn't 'need' to be run fixed at all. that's your personal preference. mine, having done plenty of both, is singlespeed. wouldn't it be dull etc and so on. And on the other side of the coin would it make a good bike for those Audax crazies who do looooong rides on fixed? Absolutely agreed, perhaps 'needs' was the wrong choice of words. it's your bike, do what you like with it. i run my Day One fixed on the road & as a SSCX so I get the best of both worlds. i enjoy the suffering riding fixed inflicts on me during group ride. toe overlap: it was possible to touch the guards with a toe but wasn't really an issue, bear in mind i have size 48 feet and i set my cleats quite far back. on the other side of the coin it's the biggest frame size. but no, we're not talking about track geometry here. the odd nudge at the lights, not much more than that. audax: definitely. i considered doing the 200km on saturday on the flyer but i had some other bits and bobs to test that were already fitted to another bike. I've no doubt it would have been well up to the job and more. I really enjoy riding single speed (and have done all winter), my biggest issue with any of the SS/fixed bikes for sale is gearing. There are no hills where I live (it just gets very windy). Most of the winter I have been using 53:18 gearing, but have recently moved it up to 53:16, this is just for training, spinning 100rpm at 20mph doesn't help me greatly, I'm afraid. They should offer the bike with your choice of gearing, I think. 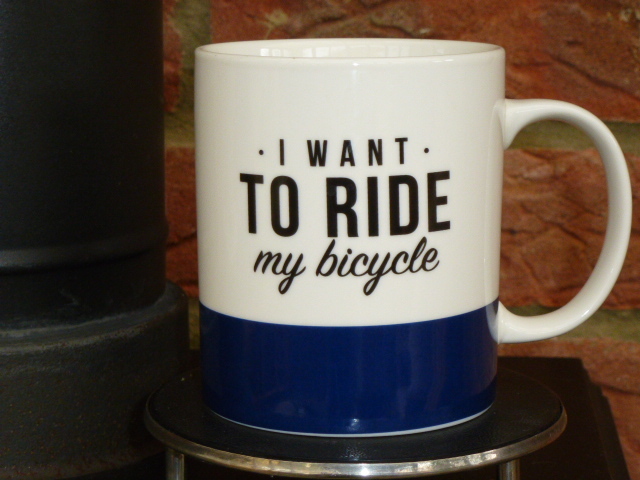 If I bought one of these, I'd be forced to blow a further £60-70 just to get is usable for my day-to-day riding. Shame really, as I could do with a replacement. If you want reasonably priced top quality chain rings I have been using these chaps down the road from me. They are exactly the same as very expensive rings that are advertised as being "Zercal". Reversible as well which extends the service life greatly. Dave, I would be interested to know what you (or others) would consider a sensible upgrade for the wheels and tyres. I have riden my flyer quite a lot (on 77" and 82") but would like to go another 1 or 2 mph faster. It would have to something that does not sacrifice too much comfort, due to tackling longer distances. I have been fortunate to pick up the 2015 model with carbon fork, apart from two tiny paint nicks it is immaculate and I am delighted with it. Being eighty and living where it's faily hilly the 64" fixed gear is right for me, I can still twiddle at 25 plus mph down hill, now working on ascending hills at the same cadence!